William B. Darden was born in 1919, which meant that he was too young to enjoy the prosperity of the "Roaring Twenties," but just the right age to be emotionally scarred by the economic ravages of the Great Depression. This hit his native South especially hard. Nevertheless, he found a way to get by in that era. In 1938, when he was just 19 years old, he opened a luncheonette in his hometown of Waycross, Georgia. At the time, fast food was not pervasive. Lunch counters, diners, soda fountains and candy stores were then seen as the way to go. Darden took this path, naming his luncheonette The Green Frog, and advertising it as "Service with a Hop." And he defied the laws of his Southern State by refusing to segregate his customers based on race. The Green Frog became successful enough that Darden was able to invest in Howard Johnson restaurants and hotels, mostly in Florida. With the growth of the automotive and air-conditioning industries making life in the South much more convenient, real estate boomed, especially in Florida, and that State's residents and tourists needed places to drive their cars to and eat. This made the once-struggling Georgia luncheonette owner one of the richest men in Florida. Darden noticed that seafood was the best-selling item in his restaurants. So he took a gamble, trying to see if a full-service seafood restaurant, designed with families in mind and thus priced less than a big-city seafood restaurant might be, would work in an area away from a shore area, reasoning that, if it could work there, it could work anywhere. He chose Lakeland, a small city with, as the name suggests, many nearby lakes, but well inland from Tampa. He called it the Red Lobster Inn, and while the word "Inn" was soon dropped, he could afford to have the signs changed, because the restaurants he opened in the next few years were so successful that General Mills made him an offer that was too good to refuse, including making him an executive within their larger company. 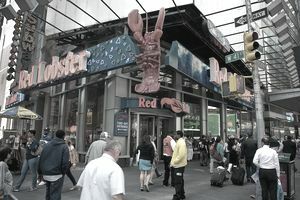 By 1980, Red Lobster was generating nearly $400 million in annual sales. General Mills started the Olive Garden chain of Italian-themed restaurants in 1982, and it became nearly as successful as Red Lobster. Bill Darden died in 1994, but General Mills established Darden Restaurants to run both chains the following year, so that his name, as well as his ideas, could live on. Not all of General Mills' experiments worked, as China Coast flopped. But after closing that chain in 1996, they moved onward with Bahama Breeze Caribbean Grille, Smokey Bones BBQ Sports Bar, LongHorn Steakhouse and Seasons 52. Red Lobster and Olive Garden remain the backbone of their operations, essentially funding the others. Along with Norman Brinker, the founder of the restaurant-management company Brinker International and the man credited with inventing the salad bar, Bill Darden was a pioneer in changing the way people eat out. While men like Ray Kroc of McDonald's and Harland Sanders of Kentucky Fried Chicken made fast, inexpensive food accessible to the masses, Darden saw the benefits of bridging the gap between the desire to eat at a fancy restaurant and the need to keep costs reasonable. Millions of people who have never heard his name and never saw his face have known and enjoyed his work. Joe R. Lee, who managed the first Red Lobster in 1968 and replaced his former boss as vice chairman of General Mills and head of Darden Restaurants, said on the founder's death, ''I know of no other person who has touched so many lives in a positive way as Bill Darden."